I am fortunate to be the oldest of eleven grandchildren. Because of my age, I was old enough to remember attending my great-great-aunt’s eightieth birthday party, dancing with my great-grandmother at my aunt’s wedding, and eating several Thanksgiving dinners with my great-great-uncle. I enjoyed spending time with my Lowell and Manhattan relatives; they had really cool stories about playing street games, stealing from ice trucks and, on one specific occasion, a time in which they were detained by police for catcalling an officer on horseback. So, when NEHGS sent me to Ridgefield, Connecticut, for a genealogical fair, I decided to take a slight detour to visit my storytelling ancestors who are buried in Calvary Cemetery in Queens. 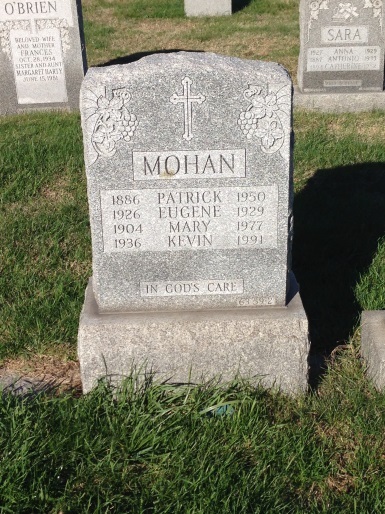 Upon arriving at Section 63 I immediately found Nana Mohan; her husband, Patrick Mohan; their 3-year-old son, Eugene Mohan; and their adult son, Kevin. I took several pictures of the grave (which were subsequently uploaded to www.findagrave.com) and began looking for the tombstone of my Nana Agnes, who was supposedly buried three or four rows behind Nana Mohan. Yet, after traversing the entirety of Section 63, I was unable to locate her grave. Maybe my grandmother was mistaken? Maybe she was buried closer to the highway overpass, as I remembered? As I tried to recall that day in August of 1990, I walked closer to the overpass, trying to pinpoint the place that I stood as an 8-year-old. I went from Section 63 to an area closer to the Expressway: Section 58. And bingo! after a few minutes I found the tombstone of my great-grandmother, Agnes N. Ambrose; her mother, Bridget Carey; her father, James P. Carey; and her 12-year-old sister, Florence Carey. I was so impressed with my memory, especially considering the distance between the two stones was not three or four rows, as mom and Nana remembered, but about 560 feet. The distance between the two lots. Now in the defense of my mother and grandmother (whom I love dearly), Calvary Cemetery is gigantic. So I can see that when family members are buried a stone’s throw from one another (if you can throw like Cy Young), it may seem as if they are only a few rows from one another. And while I often rely on my grandmother and mother’s input, this occasion reminded me to use caution when interviewing family members. Because memory can be tricky: family members can recall names, events, places, and ages differently, just as my memory of Calvary Cemetery was unlike my mother and grandmother’s recollections. So while family stories are a wonderful research tool, researchers must work to detangle memories and family lore from the facts. 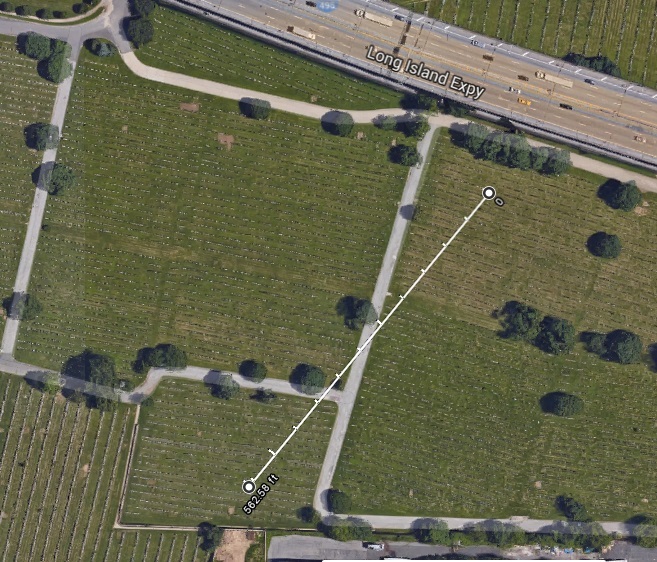 I have started to add GPS data to my cemetery finds. If you don’t have a map, or sections are not labeled this can be very helpful as most smart phones can now get very close to the location. Thank you, Lindsay. I also have dozens of relatives buried at Calvary and would like to visit. But I don’t have the plot locations as I only know the information on death certificates I found at the wonderful NYC Archives on Chambers Street. Did you try to contact the cemetery administration with any success? Yes. You can contact the administrative offices and they will provide you with plot information. HOWEVER, you need to know the month and year of you ancestor’s burial, as the records are still on microfilm. The person I spoke with was very helpful, and gave me some additional information about the plot and purchase information for my Mohan ancestors, but I knew a lot of information to start. My other NYC ancestors, I am sure, will cause more headaches. Calvary’s administrative office did suggest writing them if I wanted more look-ups done (I was initially warned that they could only do one over the phone). There is a fee involved if you require more than one look-up, so I would call beforehand to get this information. NOTE: From the title of the article, I was expecting a bit more – like how to navigate the cemetery or at least where to get information on graves. APPLAUSE! Well said and the perfect time of year for us all to remember to verify family stories. Thanks! I have many ancestors buried at Calvary, all in First, or Old, Calvary. Be aware many do not have gravestones. If you want a grave location, just call the cemetery office. You will need to provide the name and date of burial or death. They can’t look it up with just a name. I too have a lot of ancestors buried in Old Calvary. I took my elderly mother to visit those graves, which she hadn’t seen in 40 or 50 years. The office sent us to where the stones were. All were gone. When we went back to the office they told us all the stones in that section had been vandalised. Interesting–but I wonder how true as there are many stones still standing in Old Calvary. I do know that many graves at Calvary have been moved thru the years due to highway construction et al. And many could not afford a stone at time of death. There is no fee to ask where a grave is, assuming you have date of death or burial. There is a fee of at least $100 for a full list of all in the grave, when buried, who bought the grave and when. All of that is invaluable genealogical info and helps support the care of this massive cemetery–several million burials. Don’t worry about the perpetual care charge. It’s suggested, not required. 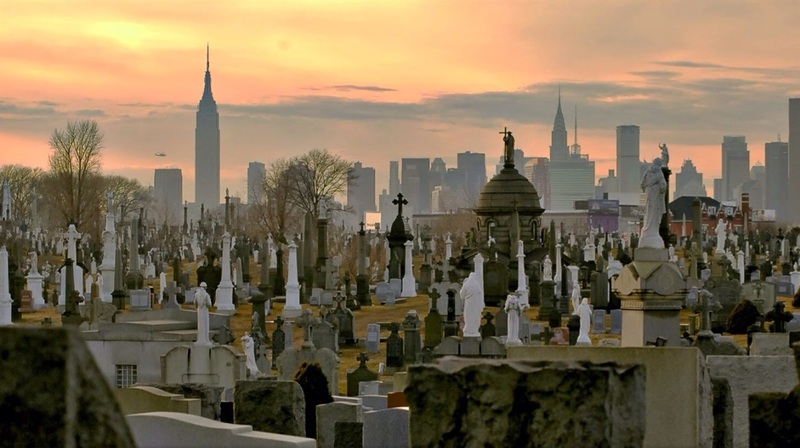 Anyone interested in Old Calvary should try to get the book “Old Calvary Cemetery, New Yorkers Carved in Stone” by Rosemary Muscarella Ardolina. It is stones that mention a place of origin in Ireland–many thousands of them. A great gift to genealogy by the author. Get it thru ILL if you can’t buy a copy. Several years ago I drove my Dad out to Calvary to find the graves of his grandparents. We knew the plot location and found it, but we were dismayed to find there were no gravestones. I contacted the office and paid the fee to get information on everyone who is buried in the plot. I too received a bill for past due perpetual care. My assumption is if my ancestors could not afford gravestones, they also could not afford perpetual care. Someday when I figure out who everyone is I hope to have the graves marked. I guess at that time I’ll also pay for perpetual care! The experience really brought home to me how incredibly poor my family was when they were starting their lives in the United States. Lovely post, Lindsay! 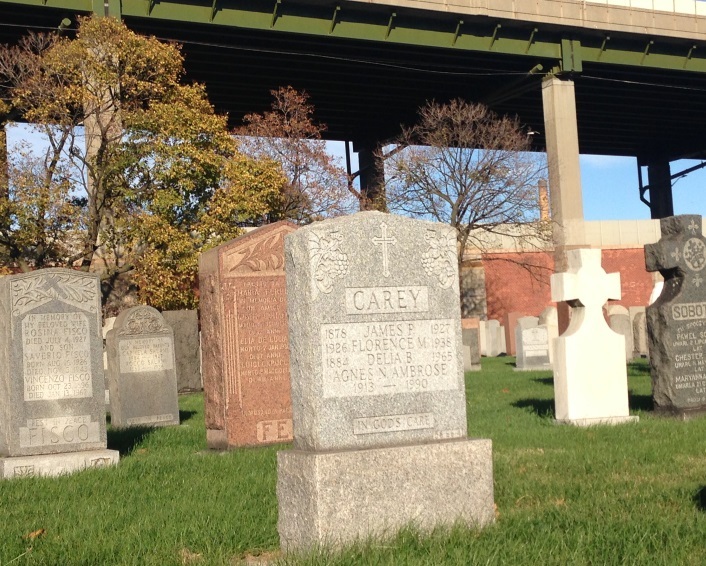 I don’t have any ancestors buried in Calvary Cemetery. But I have visited hundreds of gravesites of my ancestors in many places. I always look around and try to imagine the burial. Who were the mourners? What other graves did they visit after the service? What did they see of the terrain that I can still see? So I am pleased to read your memories as an observant 8 year old mourner, and those of an even younger girl at family gatherings. Your ancestors are fortunate that they are still alive in your thoughts and writings. Fascinating post, and a good memory from your childhood. I have no NYC family burials at all, that I know of (some in Dutch Albany and Schenectady from as far back as the 17th and 18th c, whose gravestones I’ve seen on Find-a-Grave). I do have many family members buried in a cemetery in the town of Walla Walla, in Washington State, where both my paternal grandparents’ families arrived between 1900 and 1910. There is a good online index, and having searched it, I knew the plot locations for a large number of family members. A few years ago, my brother was in Walla Walla on business and had a bit of free time. He asked if I knew where our grandparents were buried, and I gave him just their plot numbers. Once he got there, he found a bunch of others nearby, and called me right away to tell me he’d found them. He took pictures of as many as he had time for. This is a much smaller cemetery, but still big enough that he missed a few that weren’t clustered under the two names he knew to look for. He found one problem, which might occur in other cemeteries. Some family members had only their ashed interred, a considerable time after their deaths (long story). When the cemetery had only the year of death in their records, not the exact date, they used Jan. 1 for the date of death in the index. That’s what he found in a few cases where he knew the date of death, from our research. This was confusing until he found someone in the office to explain how they operated. We had the death certificates, so it was easy enough to clarify. For a very large cemetery like Calvary or those in other big cities where a single grave holds multiple interments, this might cause more than a momentary confusion. For those of us who do have smart phones with self-turning-on GPS function, but do NOT know how to really effectively use it when taking pictures, could you write a VB on “GPSing Your Cemetery Search”? This would be especially useful for those considering tramping through rural cemeteries. And just how did you get the last illustration? I’m counting at least 4 steps to finished product from what I see, but I wouldn’t know where to start. TIA.